Drip irrigation technology has made significant advances in the past few years. 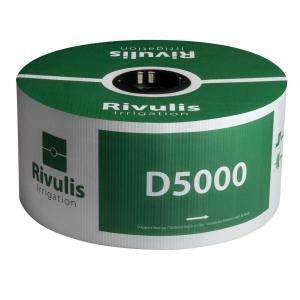 Rivulis has proven to be a leader with their D5000 Flow Regulated Drip Tape. Designed to outperform all other pressure compensating drip tape, from their state of the art quality controlled manufacturing processes to the unique multi layered dripper design. D5000 is an ideal choice for many field and row crops with long runs, sloping terrain, and in subsurface applications. Drip Depot 5/8" Perma-Loc Tape Fittings are compatible with this product.